It feels like as soon as the kids broke up for school the heavens opened and it hasn’t stopped raining since, except for a few odd days. Of course on the days where it hasn’t been too bad The Tiny 3 have been outside enjoying the fresh air, but on those days where it has been too wet to be enjoyable outside it has been a constant struggle to keep The Tiny 3 entertained without resorting to Disney Infinity and Minecraft on the Xbox or Netflix on the firestick. 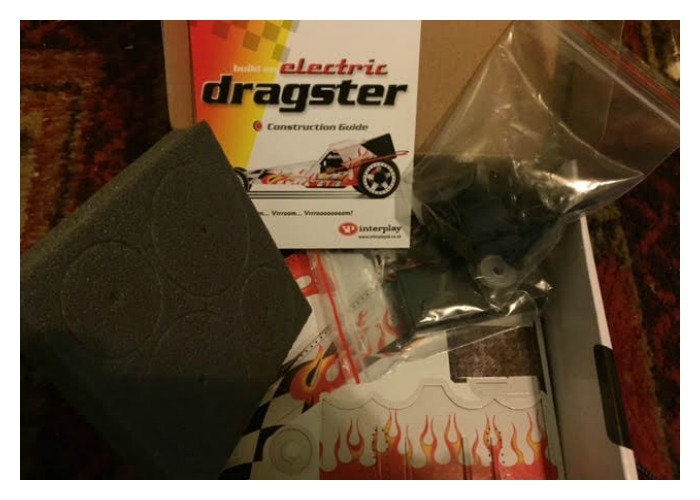 So I knew the perfect opportunity had come along to get JR away from a screen for a while when Interplay UK invited us to review the Technokit Electric Dragster. 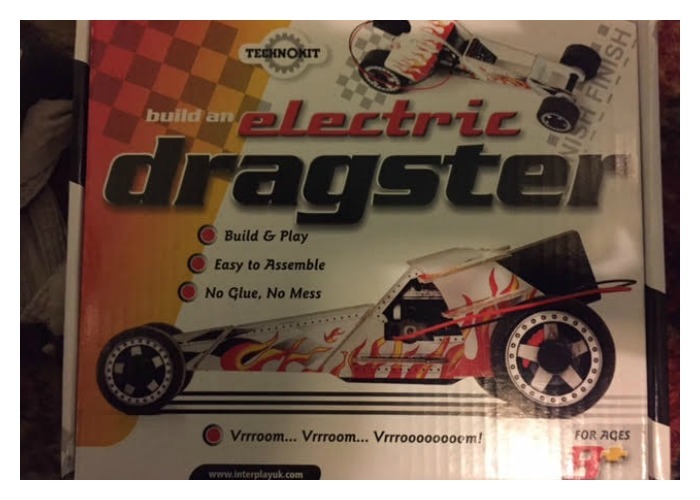 At almost 7 JR is slightly younger than the recommended age, so he needed a lot of help and instruction from me to be able to construct the Dragster. This was where my first problem came, in order for me to help JR I needed to be able to follow the instructions myself, at times they weren’t very clear, and whilst they need to be simple for children to follow I think at times a little more detail could be helpful. The only other problem we had was that JR was a little too heavy handed when attaching the wheels and he twisted one of the stub axles which attach the wheels to the axle. Although this was not a major problem as the wheel still turns and the dragster still works. Once we had worked out how to follow the instructions the Dragster fitted together fairly easily in fact JR was able to put the parts together himself as they just slot together essentially like a jigsaw, the only part I had to put together for him was attaching the battery box to the motor as the connectors are very fine. After attaching the motor JR was very excited to see it running, whilst it was able to drive on the carpet it did much better on the lino in the kitchen, which had the added bonus of scaring the cat. One of the things we both liked about the Interplay UK Electric Dragster was that only one side of the pieces was printed and that most of the panels that make the dragster could be fitted either way around so you can decorate the white side if you like, however if you decide to do this the motor has to be fitted on the other side which means that it drives in reverse, which is also pretty cool. Priced at £9.99 we would recommend it for all children who are interested in cars, engineering or construction. 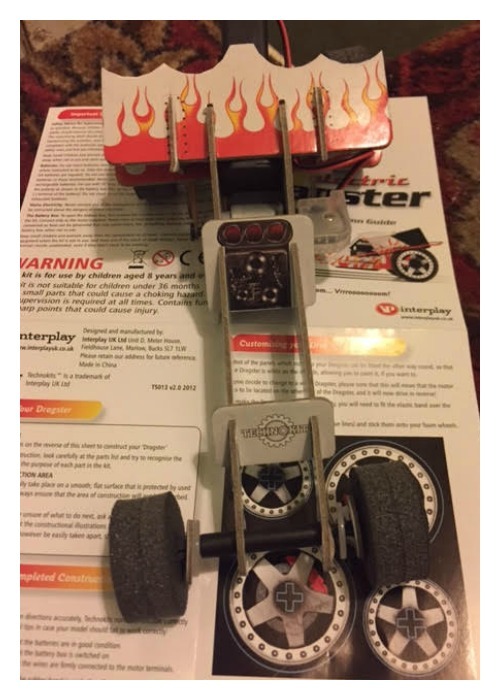 Disclosure: We were sent the Interplay UK dragster free of charge for the purposes of this review all words and pictures are my own.